1. Techies splash cash: Google announced Thursday it’s paying $ 1.1 billion to get its hands on smartphone expertise from struggling Taiwanese manufacturer HTC. Under the deal, Google(GOOG) will bring on board about 2,000 HTC engineers and technical staff. It will also license some of the Taiwanese firm’s intellectual property in a separate agreement. Google said the move shows its commitment to developing smartphones and other devices. Elsewhere in tech, Apple(AAPL, Tech30) and Dell are part of a group that is buying Toshiba’s(TOSYY) prized memory chip business for $ 18 billion. The Japanese conglomerate is offloading major assets to try to deal with a crippling financial crisis. The memory chip business is its crown jewel, and had attracted interest from tech companies like Taiwan’s Foxconn. 2. Banking on insurance: Chinese life insurance firm AIA Group is getting into Australia and New Zealand in a big way. It’s buying Commonwealth Bank of Australia’s life insurance business for $ 3 billion. 3. Stock market overview: The Dow Jones industrial average and S&P 500 hit all-time highs on Wednesday. The Dow has posted gains in each of the past nine trading sessions. 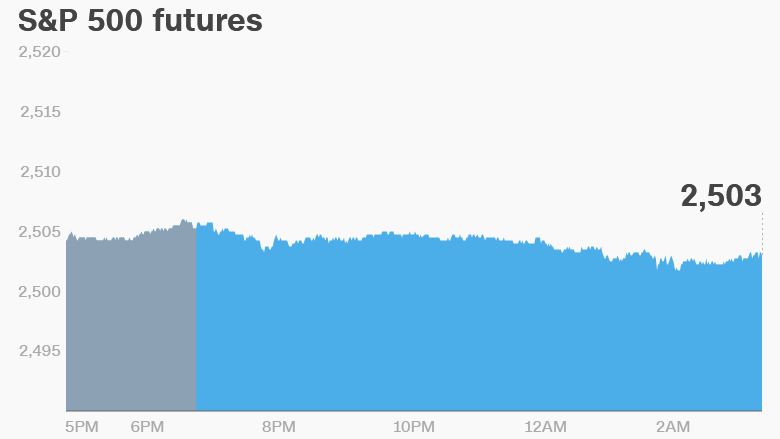 But momentum may be fading — U.S. stock futures were weak on Thursday. European stock markets climbed in early trading, though the gains were small. Most Asian markets ended the day with losses. 4. Stocks to watch — Ryanair, Manchester United: Shares in budget airline Ryanair(RYAAY) dropped by 3% on the Irish Stock Exchange as investors worry about flight cancellations. The airline recently announced it would cancel up to 50 flights per day over the next six weeks. Manchester United(MANU) will report earnings before the opening bell in New York. Shares in the soccer team are traded in the U.S.